LONDON – On World Population Day, 11 July, international donors at the landmark Family Planning Summit in London committed a total of $207 million to UNFPA, the United Nations Population Fund. The new funding will help support UNFPA’s work in more than 150 countries and territories to expand access to voluntary family planning commodities and services and strengthen national health systems. Of this funding, $132.9 million will support UNFPA’s work over the coming years, saving and improving the lives of women and young people. Some of this funding will support the provision of sexual and reproductive health services for women and girls in humanitarian settings. An additional $74.1 million will be invested in UNFPA Supplies, UNFPA’s programme for expanding access to family planning commodities. UNFPA Supplies provides over 40 per cent of donated contraceptives worldwide, reaching about 20 million women and young people each year. In 2016 alone, contraceptives provided by UNFPA Supplies helped avert about 7.1 million unintended pregnancies, 20,000 maternal deaths and 126,000 child deaths. However, UNFPA Supplies faces a funding gap of about $700 million for 2017 to 2020. Without additional funding, the programme will be forced to cut services, which will reduce the number of women and girls it can reach. If the gap is filled, however, millions of unintended pregnancies will be averted and maternal deaths and abortions will be reduced. UNFPA Supplies announced this week that it is working closely with the Bill & Melinda Gates Foundation and the United Kingdom’s Department for International Development (DFID) on a Bridge Funding Mechanism. 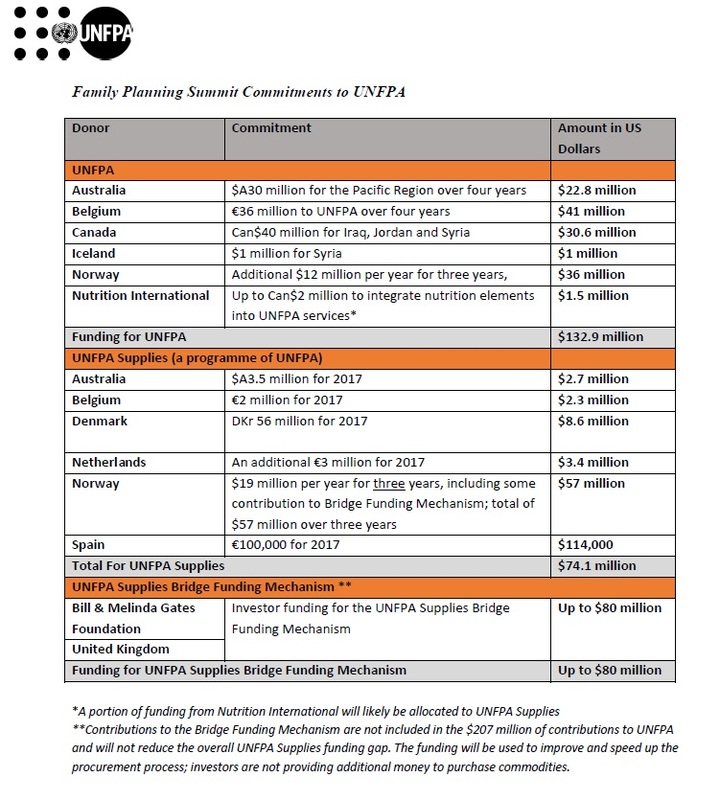 UNFPA Supplies can only procure family planning supplies with cash on hand – yet the timing of donors’ funding disbursements and countries’ requests for commodities does not always match up. The proposed Bridge Funding Mechanism would provide up to an $80 million revolving pool of financing that UNFPA Supplies could use to place commodity orders immediately to meet country needs. The pool would be replenished when committed donor funding is disbursed later in the year. It is expected that the Bridge Funding Mechanism would expedite the procurement process, lower the cost of commodities, and reduce up to 50 per cent of UNFPA-related commodity stock-outs. The Family Planning Summit brought together world leaders to discuss efforts to reach the Family Planning 2020 (FP2020) goal of providing 120 million more women and girls with access to contraceptives by 2020 – and the Sustainable Development Goal of universal access to reproductive health, including family planning, by 2030. The event was jointly hosted by DFID, the Bill & Melinda Gates Foundation and UNFPA. The world has made impressive gains in the last five years since global leaders last met in London and committed to the FP2020 goal. An additional 30.2 million women now have access to voluntary family planning. However, 214 million women in developing countries still lack modern contraceptives. UNFPA: Delivering a world where every pregnancy is wanted, every childbirth is safe and every young person's potential is fulfilled.